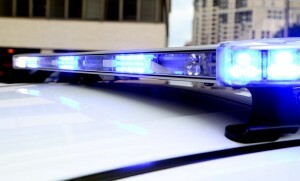 “It will focus on decision-making, coordination and integration with other organizations during an active violence incident,” police said. 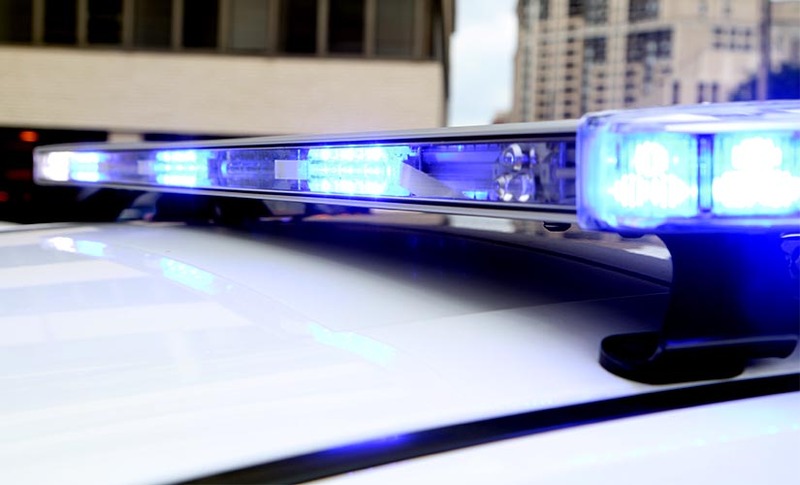 The Northern Virginia Emergency Response System, a joint effort to prepare for emergencies by the area’s law enforcement agency is sponsoring the exercise. Funding will come from the Department of Homeland Security. Police say that neither members of the public nor the media will be allowed access to the exercise and its participants. Arlington has been the site of several other terrorism, or mass violence, exercises in past years as well. 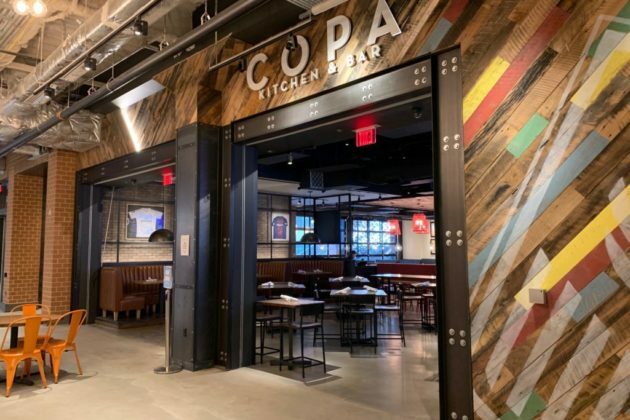 Copa Kitchen and Bar at Ballston Quarter. A seating area adjacent to Copa Kitchen and Bar at Ballston Quarter. 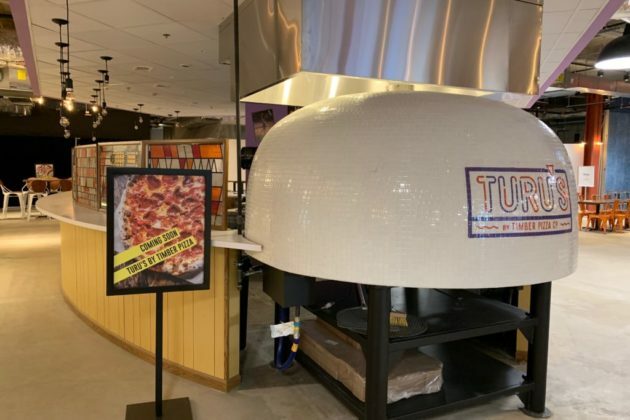 Turu’s by Timber Pizza Company at Ballston Quarter. Ice Cream Jubilee at Ballston Quarter. The location for Cucina al Volo at Ballston Quarter. 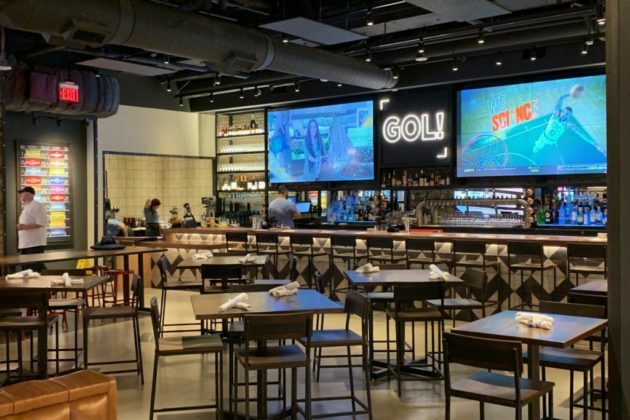 Slowly, but surely, restaurants in Ballston Quarter’s food court are opening to diners. 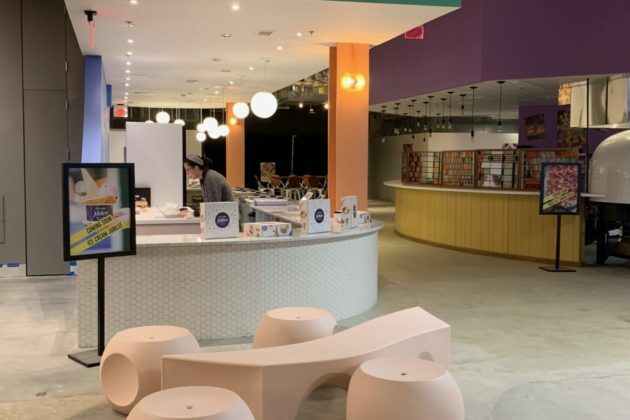 When the development opened up its “Quarter Market” to customers earlier this month, just one restaurant (Mi & Yu Noodle Bar) was open for business. In the days since then, two more have joined the club. 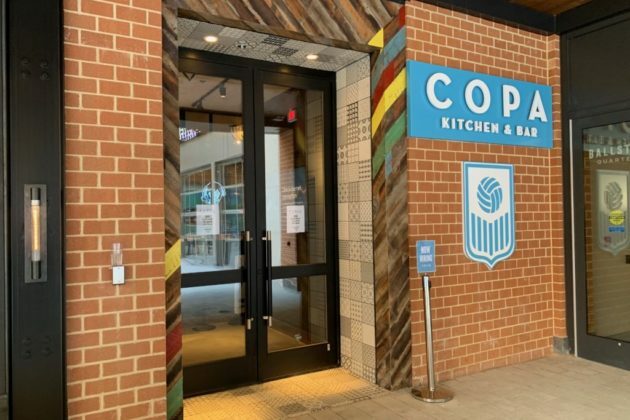 Copa opened for business last week, according to Ballston Quarter’s social media accounts, and the restaurant space is now adorned with all manner of soccer-themed apparel. Eventually, Copa also plans to offer outdoor seating in the development’s plaza. 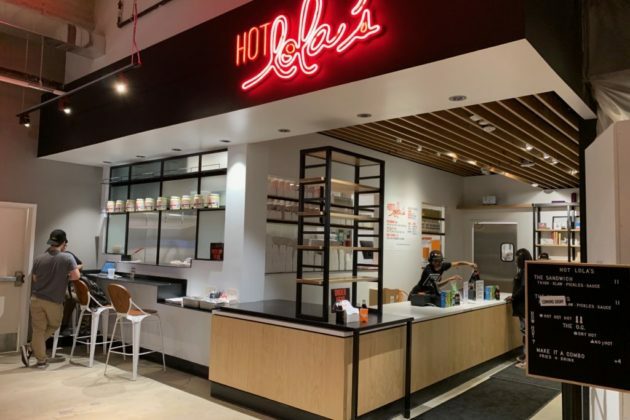 Next up was Hot Lola’s, a fast-casual restaurant offering spicy, fried chicken sandwiches. The eatery opened last weekend. Chef Kevin Tien, who also backed the Petworth restaurant Himitsu, plans to use Sichuan spices to flavor the sandwiches, which should pack plenty of punch. Diners will also be able to order chicken tenders, but those aren’t available on the restaurant’s menu just yet. Ice Cream Jubilee, a local chain offering exotic ice cream flavors of all kinds, could well be the next shop to open. The stand is mostly set up, and an employee there said the eatery could be ready to serve up scoops as early as next week. 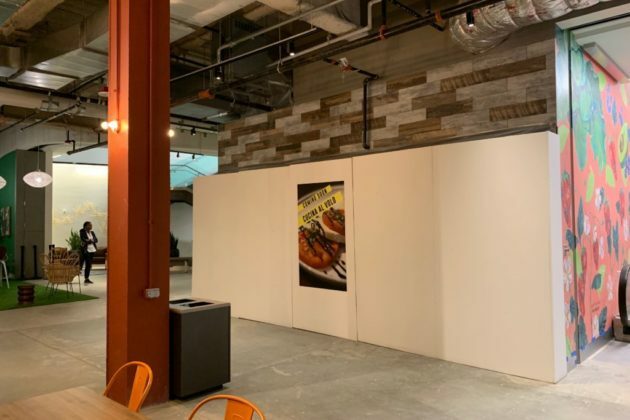 Workers also seem to have made plenty of progress on Turu’s, a restaurant from the creator’s of D.C.’s Timber Pizza Company, though no employees were at the stand Wednesday afternoon. Nearby, another restaurant backed by Timber Pizza’s owners, the Ballston Service Station, also seems to be nearing an opening. Details are still scarce about what, exactly, the location will serve up, but a quick glance behind some construction screens revealed what appeared to be a line of beer taps. State records show that the restaurant is asking for a permit to serve both beer and wine at the location. 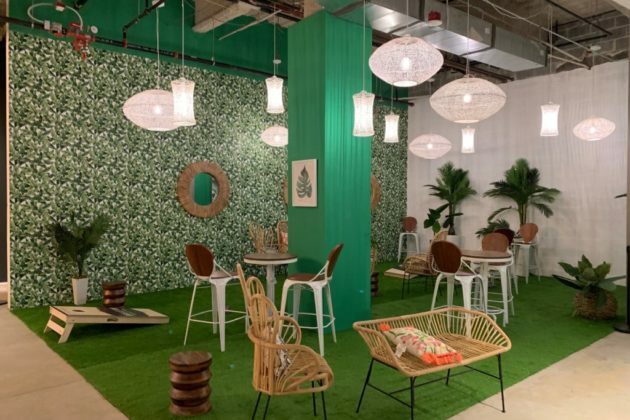 It’s been a series of false starts for Quarter Market, and the development as a whole, though shops at Ballston Quarter did start opening slowly this fall. 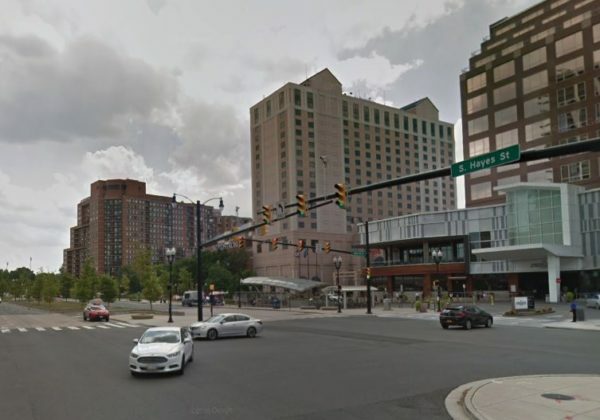 A project to build a new pedestrian bridge linking the development to the area’s Metro station via the Ballston Exchange building has also faced some hold-ups. 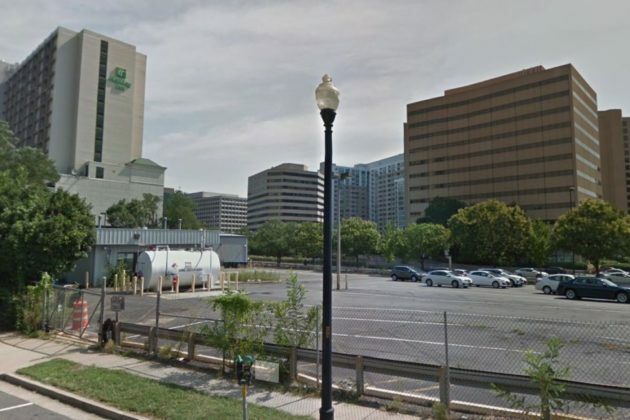 Arlington officials could soon approve additional rollbacks to the number of parking spaces required for new apartment developments along the Rosslyn-Ballston corridor. Right now, the County Board is barred from allowing new developments along certain sections of the corridor if they don’t have at least one parking space for every unit planned for the new building. The Board is now considering removing that restriction, which would specifically impact properties zoned as “R-C” districts. About 105 properties are currently zoned “R-C,” according to a staff report prepared for the County Board, and they’re generally located around the Ballston, Virginia Square and Courthouse Metro stations. 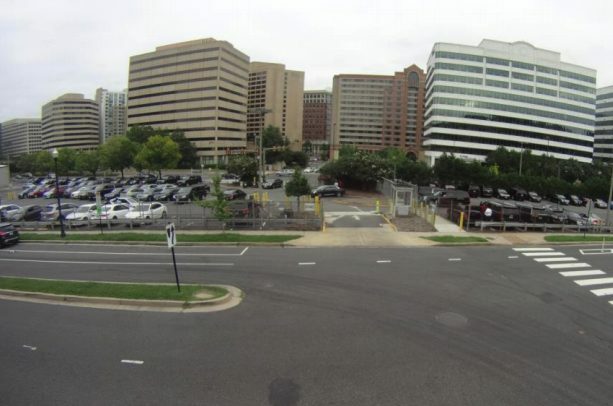 The Board approved similar reductions to parking minimums for apartment developments along the R-B corridor and in Crystal City and Pentagon City in fall 2017, in a bid to increase walkable and transit-accessible development, and staff suggested that this change would be a logical next step for the county. 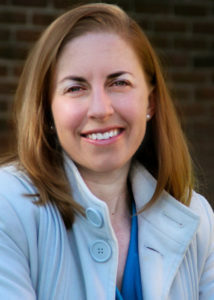 “In general, the proposed amendment could potentially facilitate multifamily residential projects in the future and that the amendment would provide the County Board the same flexibility it has when considering modifications to minimum parking ratios in other Commercial/Mixed Use Districts on a case-by-case basis,” staff wrote in the report. Those 2017 changes generally targeted properties in the immediate vicinity of Metro stations, and the newly targeted “R-C” districts are slightly different. 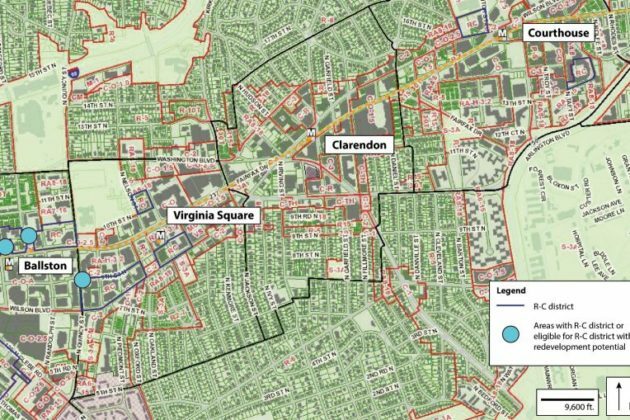 Staff describes the zones as a “transitional mixed-use zone between higher-density mixed-use areas and lower-density residential areas,” and the county’s zoning map shows that the affected properties tend to sit a block or two away from major arterial roads like Wilson Blvd or Fairfax Drive. Allowing the Board to approve similarly reduced parking minimums on those areas as well would provide “consistency” with those previous changes, staff argue. Officials have already relied on the tweaked parking requirements to allow smaller parking garages at developments around popular Metro stations on the R-B corridor. Other cities have even taken the more drastic step of banning parking minimums entirely. The Board will consider this proposal for the first time at its meeting Saturday (March 16). Members are scheduled to set a Planning Commission hearing on the matter for April 8, then hold a public hearing and vote on April 23. Residents of an affordable housing complex in Arlington Mill could soon get access to free wi-fi, thanks to the county’s own fiber optic network — but is that legal? It’s a question that vexes broadband experts and legal observers alike, who see the county potentially running afoul of some restrictive state laws, even though the project happens to be in service of a good cause. 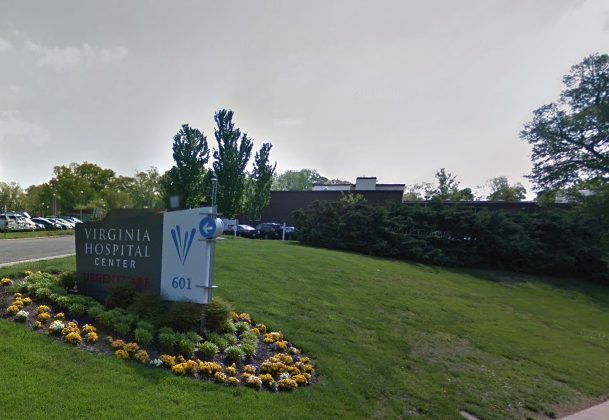 The county’s plans for this “Digital Inclusion Initiative” over at the Arlington Mill Residences have attracted new scrutiny as local officials and a team of independent experts have begun studying the “ConnectArlington” dark fiber network. That group identified a whole host of problems with the county’s management of the program, which was designed to build on Arlington’s existing fiber network to provide high-speed internet to local businesses. The county already uses the network to link its facilities together, and expanded it in 2015. 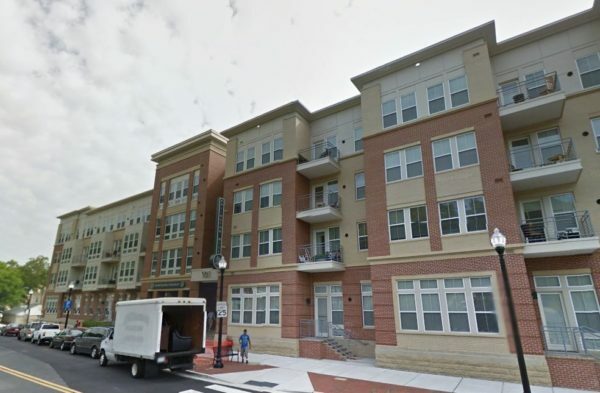 The experts did not identify any issues with the Arlington Mill project, specifically, in a report they prepared for county staff, but some members of that “Broadband Advisory Committee” told ARLnow that they harbor deep concerns about it. And a survey of other lawyers specializing in telecommunications policy reveals that it’s entirely unclear whether the project’s structure is actually legal under state law. Arlington officials and attorneys believe they’re perfectly within the bounds of the law with their efforts, and the county held a community celebration to kick off the installation of some internet equipment last month. Thus far, county leaders have billed it as a pilot project, which could inform other efforts to connect communities that lack access to low-cost internet. 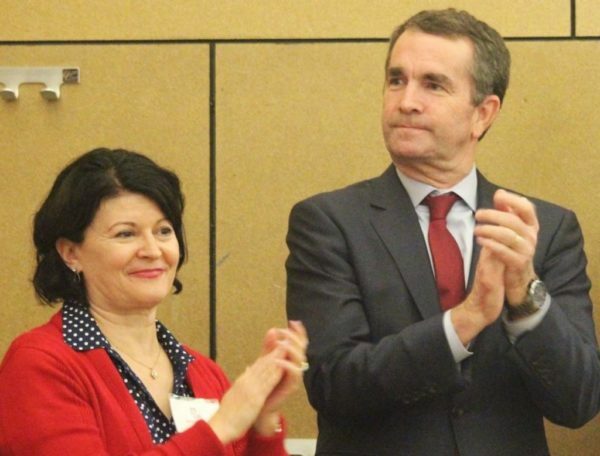 Officials are particularly enthusiastic about its potential to connect students living at Arlington Mill with the internet, closing the “homework gap” and helping kids get online and keep up with their increasingly high tech studies. But, at the very least, experts fear this means that the county has wandered into a confusing legal gray area that could invite future court challenges. Ballston Quarter could soon win the county’s approval to install large “media screens” above its public plaza. 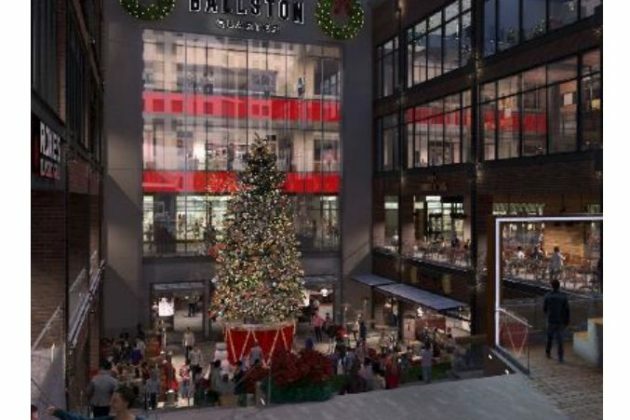 The newly renovated Ballston Common mall’s developers, Forest City, have been hoping to construct the new screens ever since the fall. But the company’s lawyers soon realized that the county zoning code wouldn’t allow for the sort of design they envisioned. Now, the County Board is gearing up to tweak zoning rules ever so slightly to let that construction move ahead. 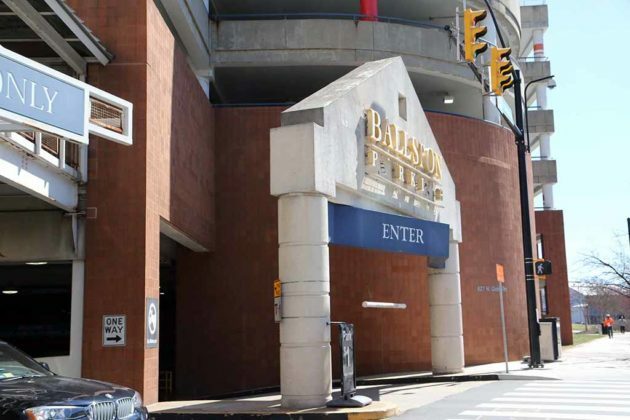 The Board is contemplating changes this weekend that would allow “urban regional shopping centers” like Ballston Quarter to install the screens up to 55 feet off the ground. Previously, the county limited such screens to a height of 40 feet off the ground. When Forest City submitted its first round of plans for the screens, the developer and county staff realized the designs called for the screens to be just over 49 feet high. Accordingly, Forest City asked for a delay in advancing those plans until county officials could come up with a zoning code amendment to allow the higher screens. The proposed changes would limit the construction of the screens only to shopping malls, and only to those within a quarter-mile of a Metro station or “major bus transfer station.” The Board will also maintain the ultimate discretion to hand out use permits to allow the screens’ installation, and staff write that they could become “one of the most regulated sign types” in all of the county’s zoning code. The signs will be allowed to display “still, scrolling, or moving images, including video, media broadcasts and animation,” per the report. The Board will only consider whether to set public hearings on the matter Saturday (March 16). So long as the Board signs off, the Planning Commission will hold an April 8 hearing on the matter, setting up a Board vote on April 23. If the zoning change passes, Forest City would still need to obtain a use permit to build the screens, so it could be months before shoppers notice them there. 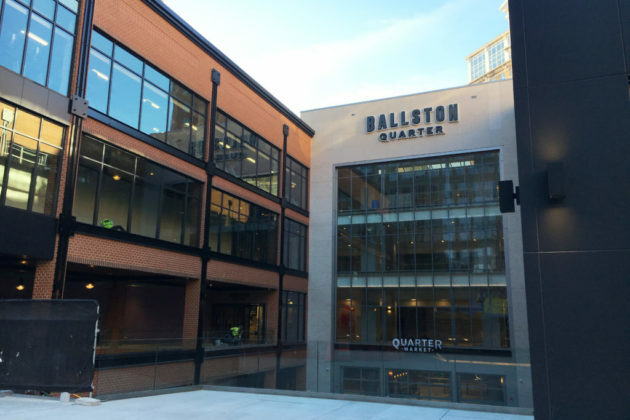 Ballston Quarter has been slowly opening stores to customers since last fall, most recently opening up its new food court for business. County officials and representatives from ridesharing companies are planning another community meeting to talk through traffic headaches generated by a staging lot for Uber and Lyft drivers serving Reagan National Airport passengers. 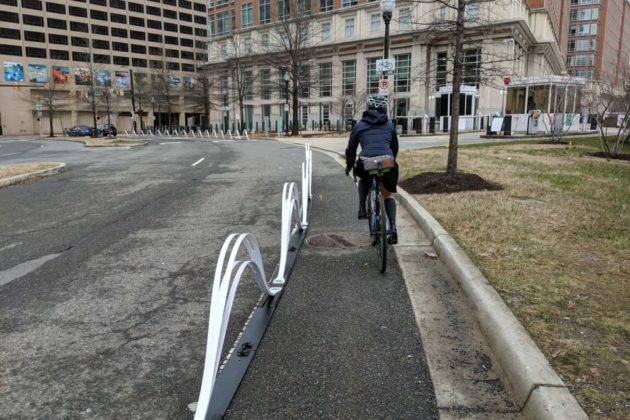 Arlington leaders will convene another gathering on the subject next week — in tandem with Uber, Lyft and airport executives — though they hope they’ve managed to alleviate many of the issues the community raised last fall. 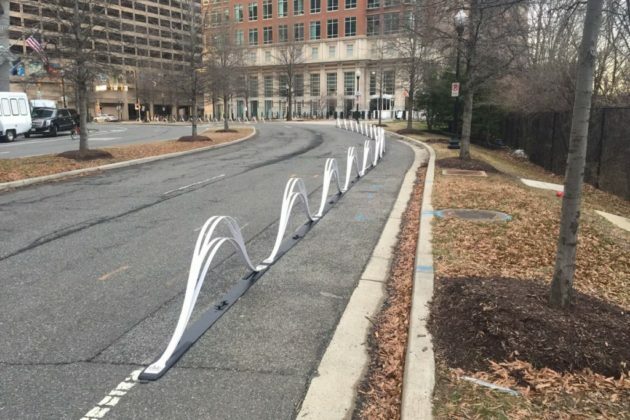 At the time, many people living near the lot (located at 2780 Jefferson Davis Highway in Crystal City, adjacent to S. Eads Street and a Holiday Inn hotel) said the surge of rideshare drivers in the area had snarled traffic in the neighborhood. Airport officials only started directing drivers over that way to account for National’s massive “Project Journey” construction effort, requiring drivers to wait in the lot until would-be passengers request rides. But, back then, the lot only had one entry/exit to reach S. Eads Street, prompting big traffic backups and encouraging drivers to cut through other parking lots in the area to more easily reach the airport. The county responded with an “interim” fix designed to make a difference in the short-term — officials opened up another entrance/exit to the lot along Route 1, installing a temporary traffic light to allow drivers to turn onto the road and jump onto an exit ramp leading directly to the airport access road. The county is also mulling another, more costly change. Officials are currently exploring the possibility of aligning the lot’s temporary exit onto Route 1 with 27th Street S., which sits directly across from the staging area. That would allow cars from the lot and 27th Street to turn at the same time, perhaps cutting down on wait times at each traffic light. 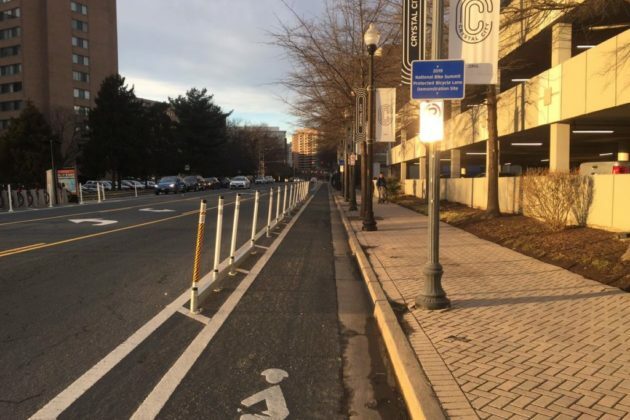 “Implementation would require relocating a traffic signal pole, replacing [the] temporary traffic signal with a permanent traffic signal pole on Route 1, and reconfiguring the [rideshare] lot to allow proper ingress flow,” county staff wrote on Arlington’s website. That project comes with a $250,000 price tag and take at least a year to complete — plus, it requires the County Board’s approval. Staff plan to discuss that option and others at the upcoming meeting. It will be held in the Crystal City Community Room at the Crystal City Shops (2100 Crystal Drive) on March 18, from 6-7:30 p.m.